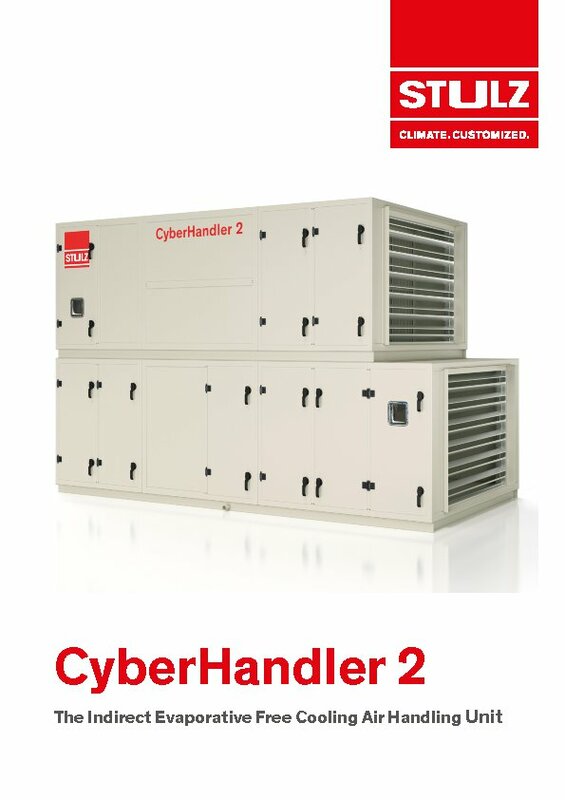 Far more than just a product, the CyberHandler 2 is a complete solution offering you not only a wide range of cooling capacities from 30 to 520 kW, but also a full range of services such as Life Cycle Cost Calculation, Reverse Osmosis water treatment, Commissioning, Maintenance and Warranty. With a high efficient indirect evaporative Free Cooling design and state-of-the-art components the CyberHandler 2 minimizes the running costs and achieves pPUE values down to 1,02. The special construction with its extremely efficient combination of Free Cooling and evaporative cooling reduces energy costs. The system has been optimized to such an extent that in most regions, 100% mechanical cooling is no longer necessary. pPUE values as low as 1.02 can be achieved. Dry Mode: At low outside temperatures, hot air from the data center is cooled down by the cold outside air via the plate heat exchanger. Wet Mode: When the outside temperature is moderate, the outside air is precooled by the adiabatic system before passing through the heat exchanger, where it cools down the air from data center. Top-Up Mode: At very high outside temperatures, a compressor refrigeration system is used in addition to the adiabatic system to provide top-up cooling. In our Test Center, located near Madrid in Spain, we can perform a variety of tests on the Air Handling Units in a state-of-the-art test chamber. This enables our clients to witness the units operating under simulated extreme conditions, providing critical information such as performance data, energy consumption and water consumption. The WIB 8000 all-in-one-web interface is user-friendly and highly functional, and it offers easy data exchange and monitoring with global adaptability. For sales and support inquiries, please make a selection below to find your local contact.